In an effort to deliver safe, healthy products that align with the companies’ core competencies, the management team at Good Food, Inc. has recently made the decision to discontinue the Mrs. Schlorer’s Mayonnaise product line. We would like to thank you for your patronage and apologize for the inconvenience. 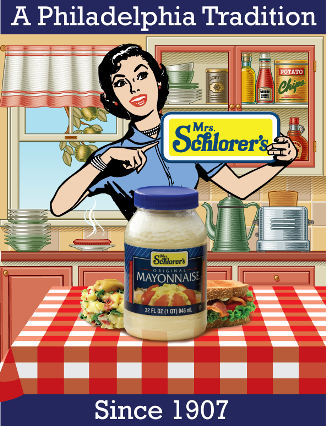 For years, Philadelphia’s taste buds delighted in Mrs. Schlorer’s Mayonnaise – the first commercial mayonnaise and a Philadelphia tradition since 1907. Wholesome ingredients perfectly blended add wonderful flavor and creamy texture to sandwiches, salads and other favorite family recipes. 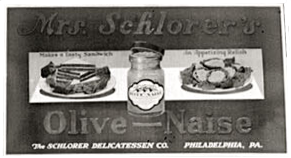 Mrs. Schlorer’s product line grew from there to include many other tasty condiments and other sandwich stables. Over 100 years later, Good Food, Inc. is carrying on the Philadelphia tradition by offering Mrs. Schlorer’s Turkey Golden Table Syrup and Mrs. Schlorer’s Ham Glaze. Buy online or call 1-800-327-4406 to place an order. Turn your holiday meal into a memorable dining experience with the taste sensations of Mrs. Schlorer’s Turkey Golden Table Syrup and Mrs. Schlorer’s Ham Glaze. One taste and your Thanksgiving and Easter feasts will never be the same! Also, the annual Pennsylvania Dutch tradition, Fasnacht Day, wouldn’t be the same without using Mrs Schlorer’s Turkey Golden Table Syrup to enhance the flavor. In the early 1900’s, Amelia Schlorer of Philadelphia, PA mastered the art of making her own mayonnaise. At that time, homemakers, often unsuccessfully, attempted to make mayonnaise following recipes from cookbooks inherited from Europe in the 18th century. Amelia would commonly use her homemade recipe in salads prepared for church functions and other community events. The positive feedback she received impressed Amelia and her husband Edward to inquire about offering her popular mayonnaise in jars in the food section of one of Philadelphia’s department stores. In 1907, twelve jars were offered for sale in glass jelly jars with typewritten labels held on by rubber bands. All of the jars were sold in less than an hour marking the first commercial mayonnaise sold in America. After the initial success of the first day of sales, Amelia Schlorer immediately began production of her bottled mayonnaise in the family kitchen with the help of son Charles and daughter Anna. The only piece of equipment used was a little beating machine which the family had previously acquired from Europe. As demand rose, the store insisted that Mrs. Schlorer im prove the packaging from less of a homemade appearance. Deciding to take a risk, Amelia went to a local glass factory where the minimum purchase was 5 gross or 720 jars. The main criteria that Amelia insisted upon was that a tablespoon easily fit into the jar opening for spooning of the mayonnaise. After six years of mixing, bottling, and labeling by hand for local grocery stores and door-to-door delivery, the Schlorer’s formed the Schlorer Delicatessen Company which was later known as Mrs. Schlorer’s, Inc. 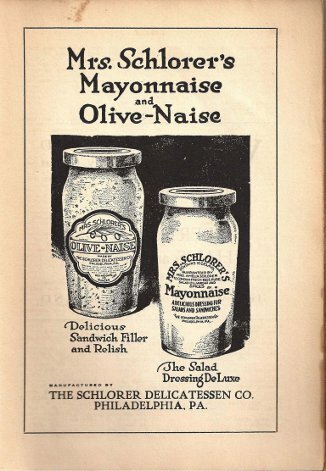 The company produced commercial salad dressings as well as mayonnaise and other products establishing the Mrs. Schlorer’s brand name as a popular custom for many family recipes.